An antique Russian enamel on metal Khodynka Cup of Sorrows from the May 18, 1896 coronation of Tsar Nicholas II, the last ruler from the Romanov Dynasty. This cup comes from the estate of Princess Helene Obolensky, the wife of the late Prince Alexander Petrovich Obolensky (1915-2002), direct descendant of the Rurik. 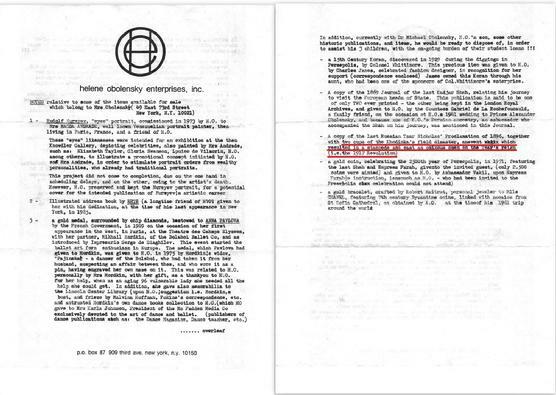 This cup with other pieces as mentioned on the reverse of the paper from Helene Obolensky Enterprises, Inc. "...cups of the Khodinka's Field disaster, an event which resulted in a stampede and cast an ominous omen on the Tsar's reign (i.e. the 1917 Revolution)". The cup is 4 1/8" tall and shows the cyphers of Nicholas II and Alexandra along with an overall geometric design and Romanov eagle on the opposite side. It is in good condition with small chips on the rim and bottom. 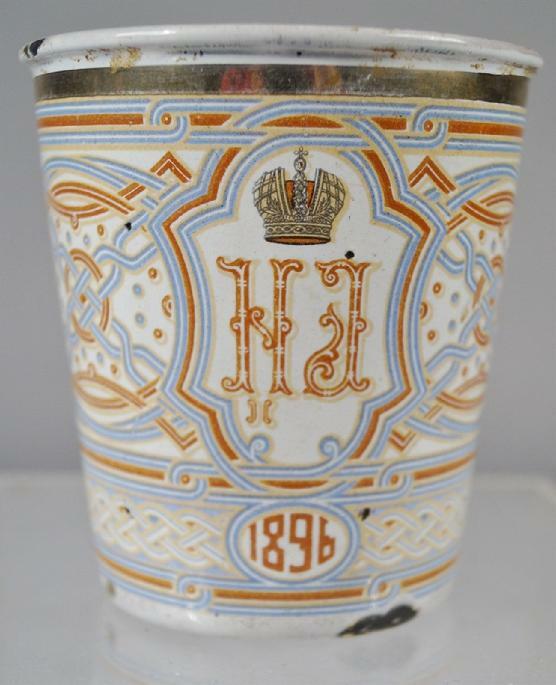 This great antique enamel cup is 120 years old. Do not miss a rare opportunity to own a piece of Russian Imperial history !